In early seventeenth century Europe, dramatic volcanic eruptions were a subject of distant memory. Readers of the Roman classics knew that Vesuvius had erupted explosively in 79 AD, destroying Pompeii and Herculaneum. But since that time, the eruptions of Vesuvius and Etna had been mild, and the active volcanoes of the Aeolian Isles, Vulcano and Stromboli, merely bubbled and provided entertaining fireworks. No one gave much thought to volcanoes. Then, in 1631, Vesuvius underwent a catastrophic eruption, destroying many homes and lives. 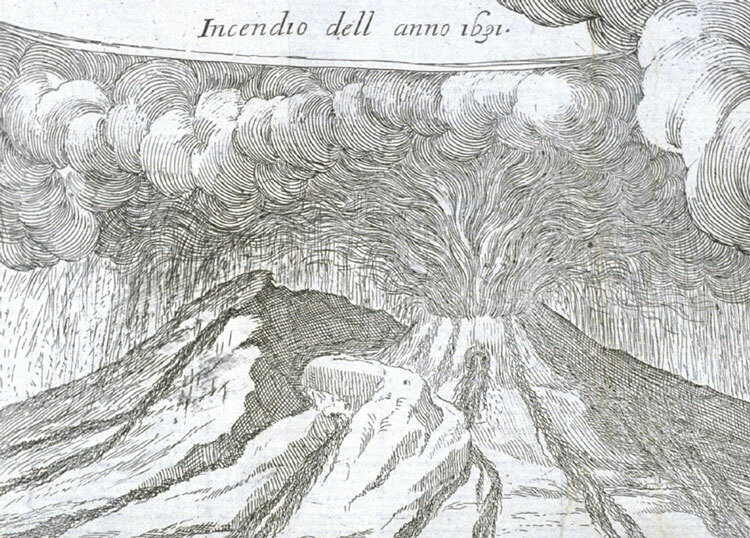 In 1669, Etna produced a similarly massive eruption, wiping out half of the city of Catania. Natural philosophers began to pay more attention to volcanoes and speculated about the cause of volcanic eruptions. They did not yet suspect, however, that volcanoes might have played a significant role in shaping the surface of the earth. The illustration is a detail of the engraving displayed in exhibit item 5.